There's a lot of vocabulary and lingo that gets thrown around at a venue during a performance. Anybody who's been gigging for a while will have likely picked up on all of these terms, but if you're new to gigging, the jargon could be a little overwhelming. If that's you, here are a few key terms that will hopefully allow communication between you and the venue staff to go smoothly. The time that you need to be at the venue with your gear, ready to load it in. Even if your set time isn't until 10:30 p.m., and the load-in time is 4:15 p.m., you should be at the venue ready to go at 3:45 p.m. The time that the venue staff plans to open the doors to the audience. Load-in and soundcheck need to be finished by this time. The time at which the first band is slated to begin their set. Even if you have a few bands before your set, try to be back in the venue by this time so that you can watch at least part of every band's performance. The time that you are supposed to start, and the amount of time you have onstage. The flexibility of this time depends on the type of show. At a casual house show, you might end up going on an hour after you were originally supposed to, and could probably getting away with playing 35 to 60 minutes when the sets are technically supposed to be 45 minutes. At a festival, these times are very strict, and if you're late, your set time will likely be cut short. The person/company that set the show up. He or she is your primary point of contact for any details regarding the concert. Somebody you put on your band's "guest list" who will be able to attend the concert for free. The person who sits at the door collecting money and passing out tickets. He or she is also usually the one who'll provide your band with drink tickets and stamps/wristbands, and who you'll give your +1 requests to. Technical term for the "sound guy/girl." This is the person who sits at the mixing board and runs sound for the night (obviously). Come to this person when discussing any special needs onstage, and be sure to give him or her your stage plot/input list as soon as you can. Try as hard as possible to remember his or her name, and be extra nice. The venue's booking contact. If you booked the concert through the venue rather than a third-party promoter, this is who you've been talking to and who will be your primary contact point. How much one ticket to the performance costs. This price will often be lower for tickets that are purchased in advance. Contract or section of a contract that specifies the needs of a performing band (such as having a bowl of brown M&Ms ready backstage by the time the band arrives). Don't consume food and drinks that you find backstage until you ask your venue contact, as they are likely items that were on another band's rider (that they are paying for). Money that you've been promised for the concert. This number is arranged in advance and confirmed by contract; you'll be given your guarantee regardless of how many people attend the concert (unless otherwise specified in the contract). Make sure that you actually get this sealed by a contract, so you can avoid getting swindled by a shifty venue/promoter. When the money that was made at the door from ticket sales is split between the bands, after the venue staff has received its pay. Not always an even split; often, a larger percentage will go to the headliner and/or bands that are currently on tour. An arrangement where you're essentially paying the venue to perform, so that it ensures it's able to pay its staff and rent. Sometimes, this comes from a room rental fee. Other times, you'll be given a number of tickets to sell and required to pay for any tickets you haven't sold by showtime. What it costs to use the venue for the night, including the cost of the staff that's employed. A separate room in the venue where bands may store their equipment and relax before and after their set. Not all venues have a green room, and very few are actually green. An area behind/beside/near the stage where you can prepare your equipment while the band before you plays. Not a green room, and not really a place where you should be hanging out if you aren’t about to go on stage (unless the venue is large enough that you can be backstage and still out of the way). 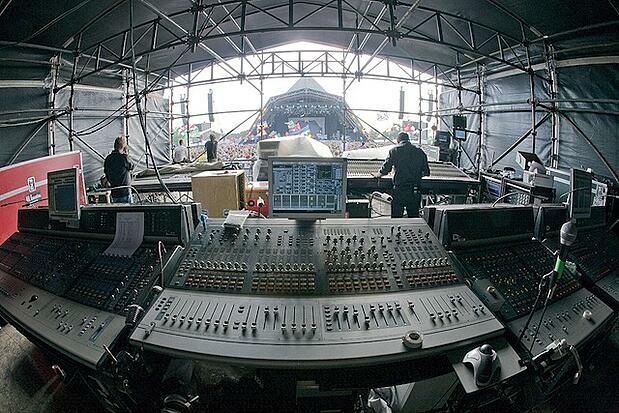 The area where the sound engineer's equipment is set up. Not always an actual booth. Right and left orientation from the perspective of somebody who's standing onstage facing the audience. When you check your instrument to make sure that its signal is getting picked up and sent to the sound engineer properly. Be sure that your check is clear and at the same volume that you plan to use when you perform. Don't stop checking your instrument/microphone until the sound engineer specifically tells you to do so. When the engineer listens to your band playing together simultaneously after line checking so that he or she can get a basic mix set up. If you aren't headlining or the show is on a tight schedule, you might only get a line check. The mixing board at which the sound engineer is working. The speakers that are sitting on stage and aimed towards you and the band. Your monitor mix is what you hear in the monitor nearest you. Try to understand that your sound engineer cannot hear the monitor mix from the board, and you'll need to tell him or her politely if you're hearing too much/too little of something in your monitor. The big speakers that are facing towards the audience. This mix is what your sound engineer is going to be focused on unless you specifically tell him or her to change something about your monitor mix. Also note that your monitor mix is not representative of the mix that's coming out of the mains; even if you weren't happy with your monitor mix, that doesn't mean that the sound sucked or that your sound engineer sucked. If you're running your instrument directly into the board, you'll need to run through a direct input (DI) box so that your signal will be boosted/cut to a level that's appropriate for the board's input. This is called "running direct." If you don't have a DI box, the venue typically will. Just be sure to ask for one politely. The volume that's coming from the stage itself from any amplifiers, drums, or other instruments. Your sound engineer may request that you raise/lower your stage volume so that he or she can get the best mix possible through the mains.